These old computer generated reconstructions are comparable with reconstructions using more modern data. Hopefully this program will simulate interest in writing more up to date computer programs that can display Expanding Earth as well as Constant Diameter Earth data for the ancient Earth to enable reconstructions to be compared in detail. The program is written in Superbasic to run on a Sinclair QL expanded to 512 Kbytes of memory with a trump card. This ancient machine is amazingly slow with a small memory by today's standards, but in the early 1990s it had some major advantages over other machines (remember a PC was still running DOS then). It could easily be programmed to produce a drawing of a globe with commands like 'Line', and the code also had various mathematical functions readily available. I wrote this program to confirm to myself that the ancient continents and ocean floor could be reconstructed on a smaller diameter Earth, just like a gigantic jigsaw puzzle, and some of the original reconstructions produced by the program are published in various editions of my book Dinosaurs and the Expanding Earth from 1994 onwards and also on this web site. Although many of the globes produced by the program are still being used by me today, the program itself had ceased to be used many years ago and the files had been archived. I initially intended simply to retrieve the files to publish the Basic code in case this might be of some use to anyone else, but other people must remember the Sinclair QL machine with as much fondness as me because a number of emulators for this machine are available. After some investigation it was apparent that the program still ran on at least one of them, so I have also made the original program available since it (mostly) still works. You will need to purchase an emulator if you want to run the program, but you don’t need to do this to see the program working since I’ve provided a YouTube video with narration of the program operating. The ocean floor has been mapped to give a detailed account of the age of the Earth’s ocean floor. By removing the ocean floor that is known to be younger than a particular age, it is possible to reconstruct the ancient Earth by rejoining the remaining ocean floors. This program first calculates all the outlines of the continents and ocean floors using spherical trigonometry on the Earth of today’s diameter and stores that data in a three dimensional format, so each plate is stored as a set of specific locations in three dimensions. Then, using an ancient Earth diameter which is smaller, the outlines of the continents and ocean floors are recalculated for each plate on this smaller world. By moving and rotating these plates and then re-calculating their outlines it is possible to adjust the diameter of the Earth until all the outlines mesh together. There is one problem with this method of calculation which cannot be overlooked - if a section of a globe is cut and placed on a larger globe, the section will not fit without distorting it. There are two possible methods of distorting this section – either the outer edges of the section can be torn to fit the larger diameter, or the inner part of the section may be crumpled. In terms of deforming the Earth, both of these methods should leave clear signs in the Earth’s crust. If the central section is crumpled and crushed it would tend to produce mountains by folding of the Earth’s crust. But although the expansion of the Earth may result in mountain building in areas where the continental crust is weak, the major portion of the continental crust seems to remain solid despite the distortions imposed on it. Fortunately the continents only cover a small portion of the Earth’s surface. Most of the Earth’s surface is covered by ocean floor, and this gives every indication of having been torn apart at the outer edges. On examining the newly-formed ocean floor at the ocean ridges it is possible to observe transform faults running at right angles to the ocean ridges. These faults are kilometres wide in places. An indication of how these transform faults would occur on an Expanding Earth can be gained by imagining a section of any small sphere being placed on a larger sphere. The smaller section will not fit unless the outer edges of the small section are torn apart. This same effect would tend to tear the outer edges of the ocean floor to produce the transform faults. 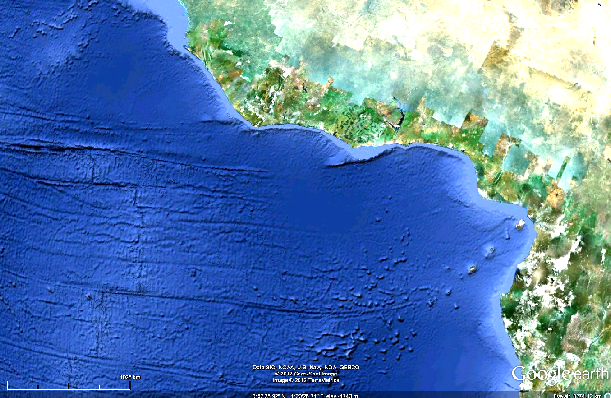 We can see these transform faults on the Google Earth picture shown below. Since the continents are small compared to the ocean floors, I decided to calculate the ancient plates’ size and shape by assuming that most of this distortion was caused by being torn at the ocean ridge as the diameter of the Earth increased. There are a large number of calculations involved. A continent the size of Africa would need at least a few hundred complex calculations to outline its shape, and after repositioning it on a smaller globe, a further few hundred to outline it on a smaller globe. All the ocean floor ages on each continental plate also need to have similar mathematical treatments. Multiply these calculations by the number of plates on the globe, the movement of the plates, and the variation in size of the Earth with time, and you have an immense number of calculations. This program performs those calculations to reposition the various continental plates on a smaller diameter Earth. The maps can be redrawn in Mercator projection within a few minutes. The picture of a globe takes slightly longer. This quick redraw time allows all the major plates to be positioned while varying the diameter of the Earth until the plates fit neatly together with a high degree of accuracy. One of the most useful plates for determining the size of the ancient Earth is the European-Asian-North American plate since this plate is effectively joined together to form one continuous continental land mass. The continental plate stretches from Russia, across the Bering Sea, and into Alaska. Because this plate stretches completely around the globe, there can be only one diameter for any particular age. The program itself can be viewed as a pdf file without the emulator so you can look at how the program works in detail (see the link below). The QL Superbasic allows procedures to be defined by names which can be called by placing the name in the main program. (I’ve been told that this is a very old programming style now and modern programmers use ‘object based programming’). The procedure 'redraw' at line number 3940 redraws the continental outlines, continental shelves and the age of the ocean floor attached to particular plates that have been previously defined from geological ocean floor data. After asking for the Earth's age (line 3980) it opens the continents data file, if the continent age is greater (older) than the Earth's age that data file is opened (4170 - pick_up_position). If the age of the ocean floor is older than the Earth then latitude and longitude are repositioned (4220) and then drawn. Any data that is younger than the age of the redraw is simply ignored. The map can be drawn as a Mercator projection map, or a full screen (which simply draws the map without any projection) or as a globe. Every point is recalculated as required. One of the main procedures is pick_up_positions which reads the latitude, longitude and radius data and calculates how all the continental plates need to be repositioned depending on the Earth's radius and the position and rotation of the continental plate. The continental plate is calculated to 'wrap' around the smaller diameter Earth as well as being repositioned and rotated depending on the previous data input. You can see this uses spherical trigonometry to achieve the result required. The procedure to edit the Earth's radius and positions no longer works but the data file can be edited with the ‘notepad’ program available on a standard PC. Other programs seem to destroy the formatting so don’t use Word for example. This data is stored in 10 million year intervals. The first figure is the size of the Earth in km at that time. Then the continental plate is shown with the latitude and longitude centre of rotation. The next three figures are the repositioned latitude and longitude and the rotation of the plate. As an example, the positions for all the plates at 100 million years can be changed by opening the positions_100 file and then changing the diameter to 7000 and the South America plate new latitude, longitude and rotation to 40, 50 and 30. Remember to save the data. If you now redraw the maps with the new data it is obvious that the diameter of the Earth and the positions of South America have changed. This is shown in the YouTube video. The active command simply draws multiple globes so an animated or rotating globe can be produced and then allows the animated globes to be displayed. As you can see this program stores and calculates the continents and the ocean floor data in a spherical three dimensional data format as it recalculates the Expanding Earth globes and maps. It should be obvious that any program would need to keep the data in a 3D format so no distortions are produced in the reconstructions – a two dimensional ‘map’ format is not acceptable to reposition the continents! It would seem unlikely that a more modern program would need to calculate globes since these will probably already be available but the reposition calculations will still need to be performed as a 3D model within the program. If you still want to try to run the original program there are a range of options available but I would suggest buying the Q-emulator. This is the one I purchased. You might like to try the demo version first. The Q-emulator demo version crashes the Expanding Earth Program after asking to adjust data space but this is due to memory limits on the demo. The full version (mostly) runs the program if the memory is set to 16 Mbytes. This emulator can save files and data to the hard drive and is currently £30.80. This is the emulator I used to produce the YouTube video, but as I’ve already said, you shouldn’t need this just to see now it operates. I hope this gives you some ideas for future developments!